Sports Labs recently successfully carried out the FIFA 2 star certification of Italgreen S.p.a latest FIFA project. 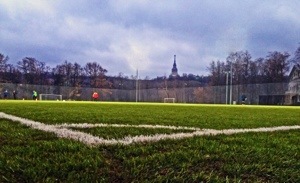 The field is located in Russia’s capital city Moscow within the Luzhniki Stadium complex, the home of Russian football. The brand new 62 Double T Evo carpet was installed overlying a a prefabricated drainage layer and in filled using organic Geofill infill, thus making it as we understand it the first FIFA certified organic infill field in Russia.